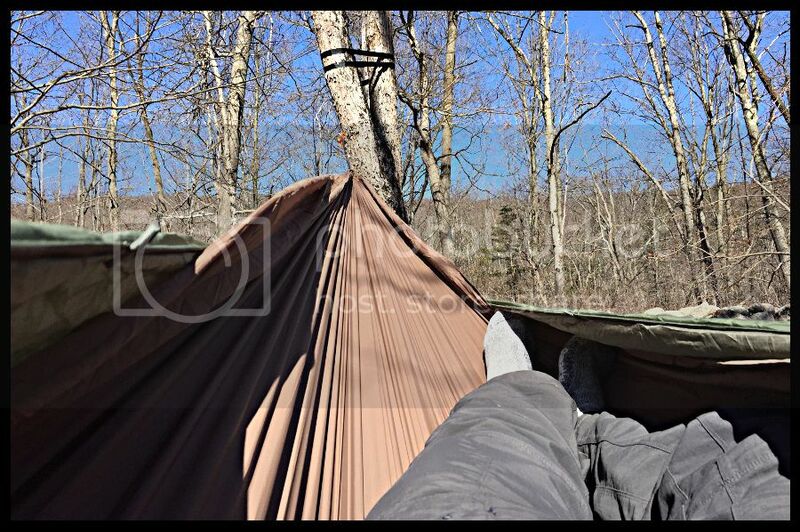 i spent most of my sunday lounging around in my new dutchware hammock. i spent 3 nights in a hammock last year and liked it a lot so i'm making a serious attempt this year to hang year round. still waiting on the 0? 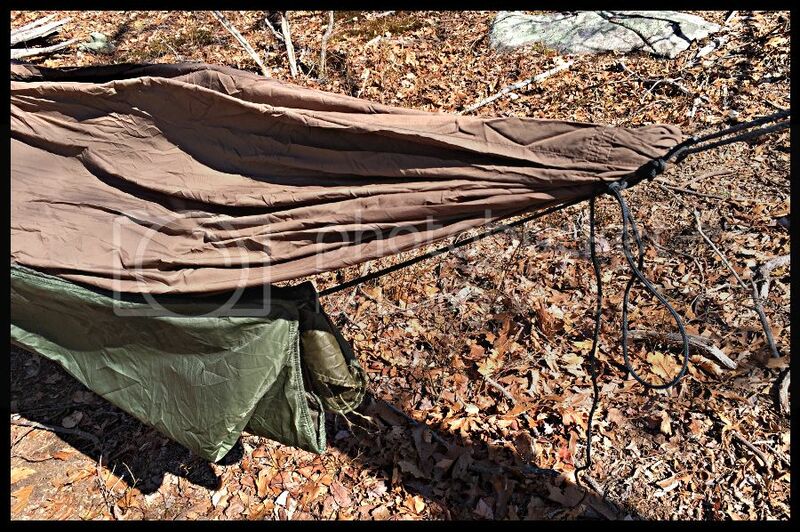 f down underquilt so rigged up my kifaru woobie to see what it's like. i didn't have shock cord handy so i attached it loosely to prevent putting too much load on the loops. worked out a lot better than i expected...i think it's rated as a 40? 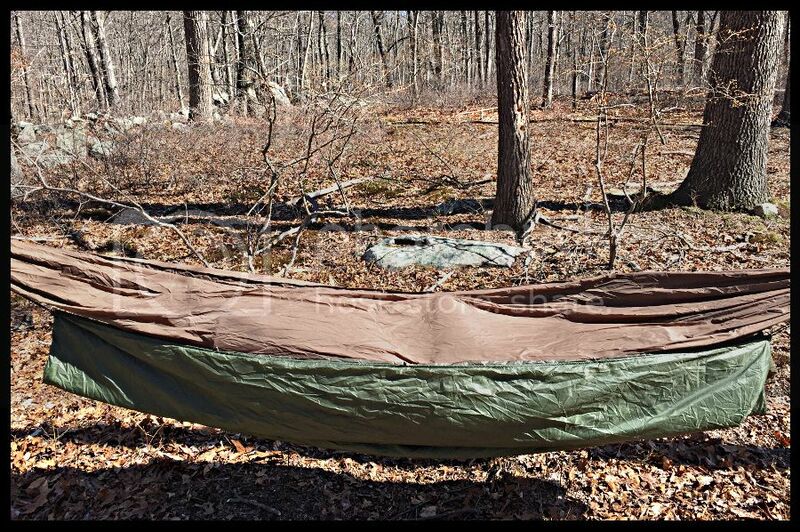 f blanket so this will work for those summer nights when no insulation is a tad bit too cold...the hammock is a double layer and between it i also had a gossamer gear thinlight hammock foam pad (0.25? x 3' 3? x 4' 11?) and my back was plenty warm despite the wind and high 30's. 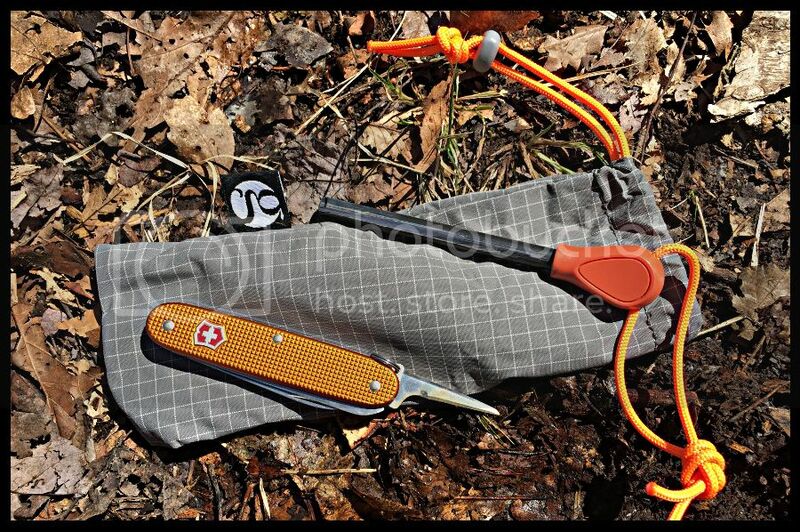 i can keep the sides up as well if i shock-corded the 3 side loops (this one is mid thigh, the other two are near my ankle and shoulder) to the ridgeline. yup, new tarp yet again! 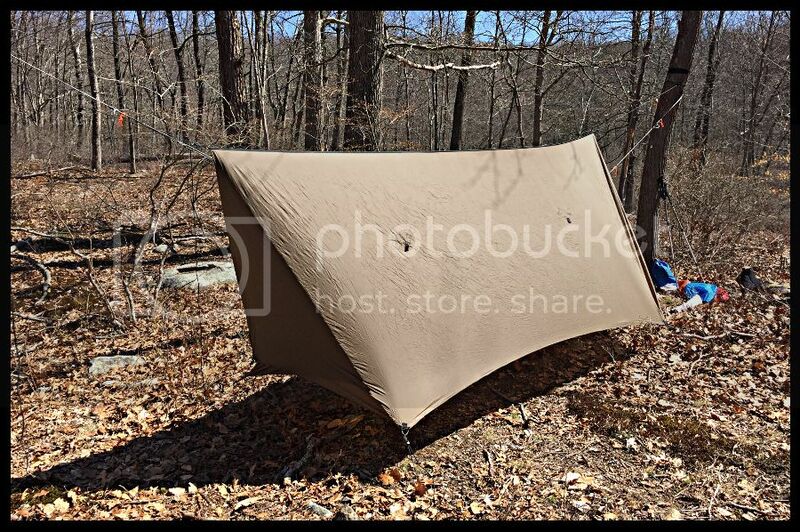 this time it's a warbonnet superfly...just when i've got my ground sleep setup figured out i start from scratch again. not sure i'm going to buy spreader bars...just staking out the walls to the ground created a ton of room already. Re: planning my escape from the ground. porch mode is by far my favorite. can't wait just to lounge around and watch the rain all day! 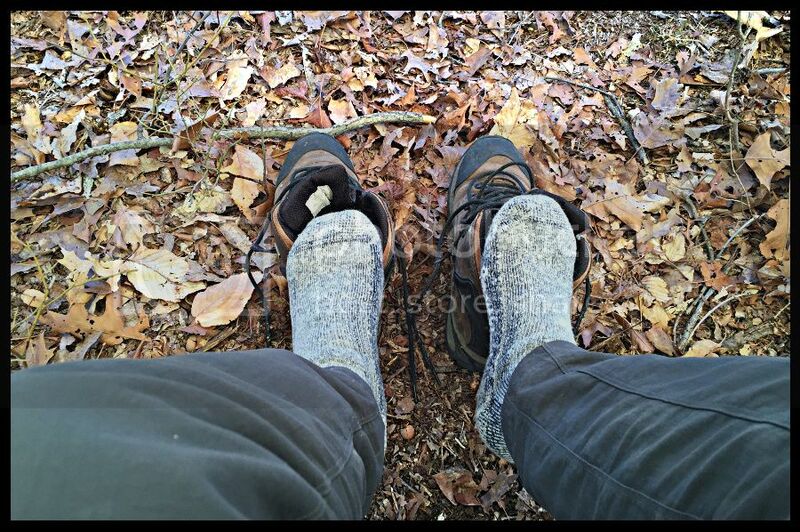 one tip i didn't read about for new hammockers is bring crocs/slippers for the first time out...i was putting my boots on and off too many times to count while adjusting things all over the place...downright annoying either walking with my feet flopping all over or constantly re-tying the laces. my grumbling stomach was the only thing that got me off the hammock. 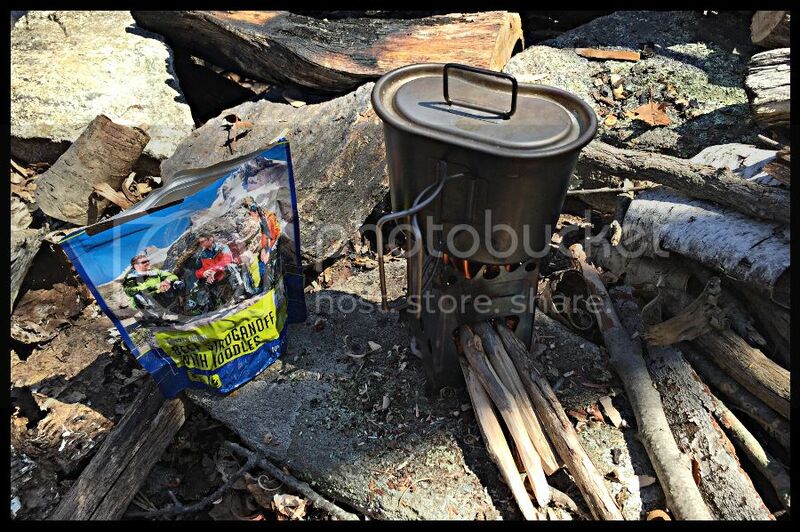 i kinda wished i brought an alcohol stove instead so the circle of laziness would've been complete! Nice setup. I love hanging in a hammock. 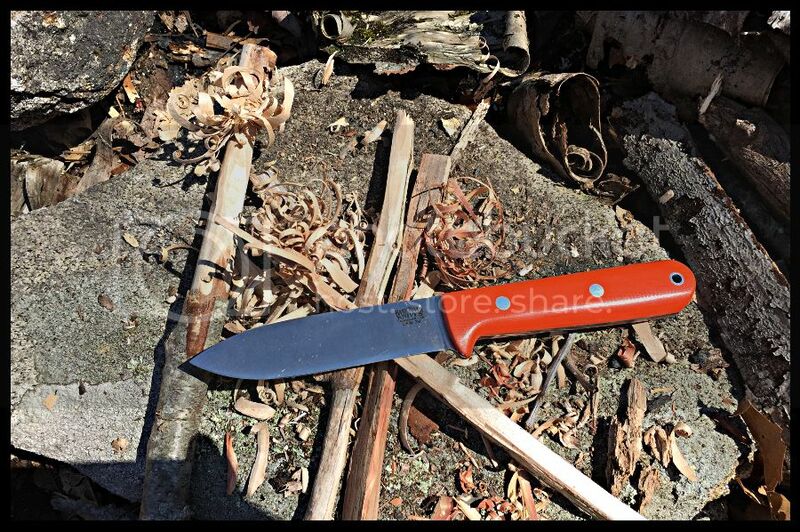 Just had to pop in and say the orange ALOX knife looks cool. I love that tarp. I think it's important to have ends that close like that. For me, just for the privacy alone. If anyone else is interested in sewing their own. 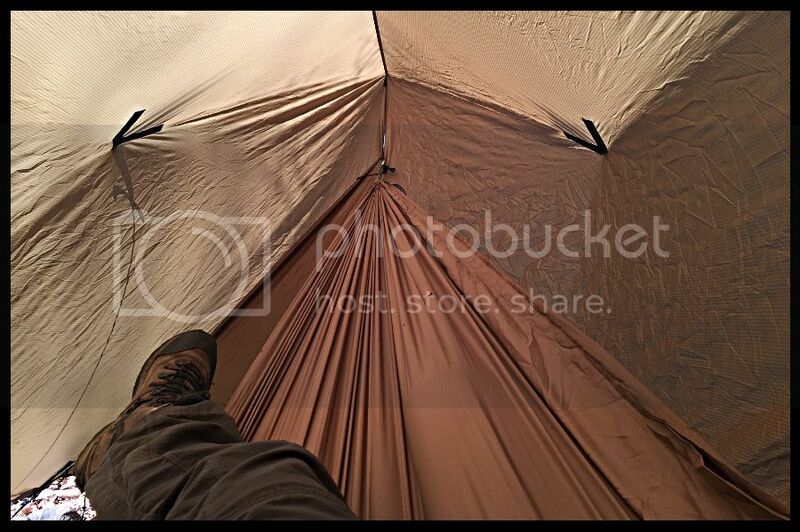 Here is a good link to parachute material sold by the yard for cheap. Nice setup you've got there JV3. 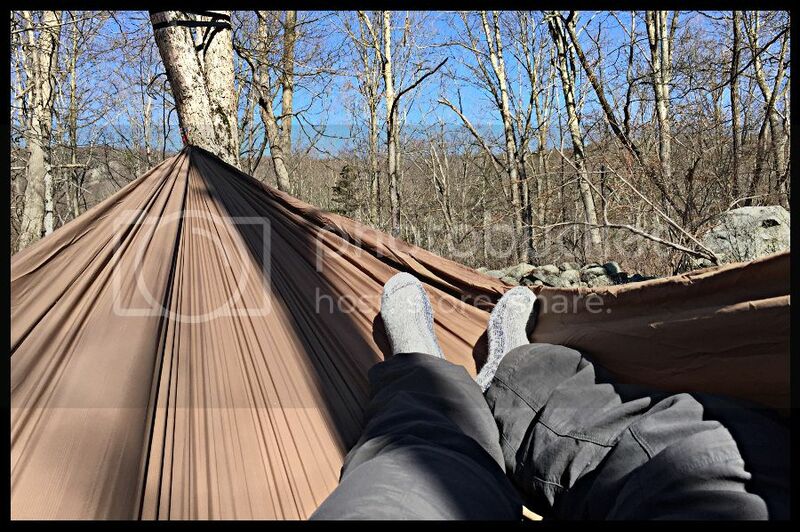 That Dutch is a great guy with some awesome bits and bobbles for hammock campers. I highly recommend his stuff. 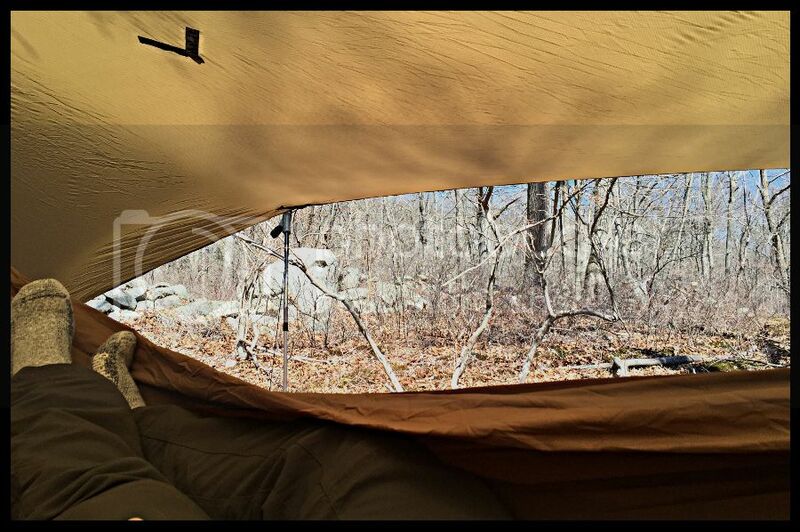 A non-structural ridge line and triangle thingie will help you pull your under quilt up against you. 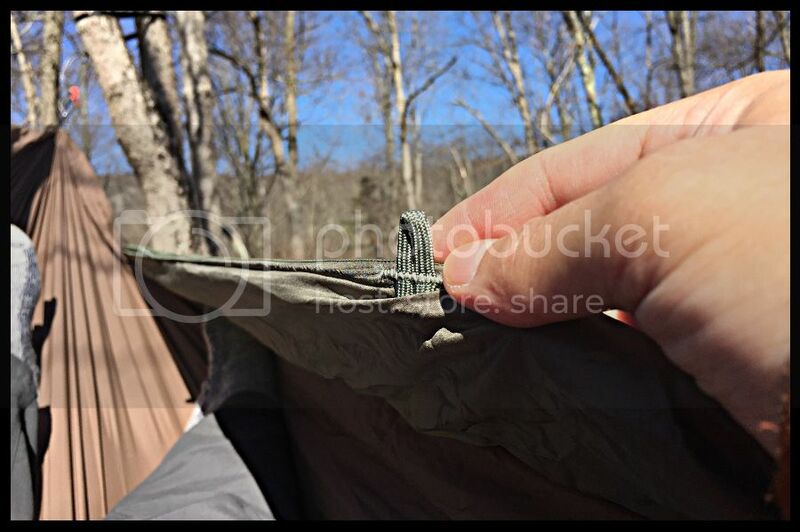 And a Knotty Side Mod is easy and really helps keep your top quilt in the hammock with you. thanks! try it and you might be surprised...i should've tried it years ago! thanks! i'm definitely a convert and already sold most of my ground setup. thanks! 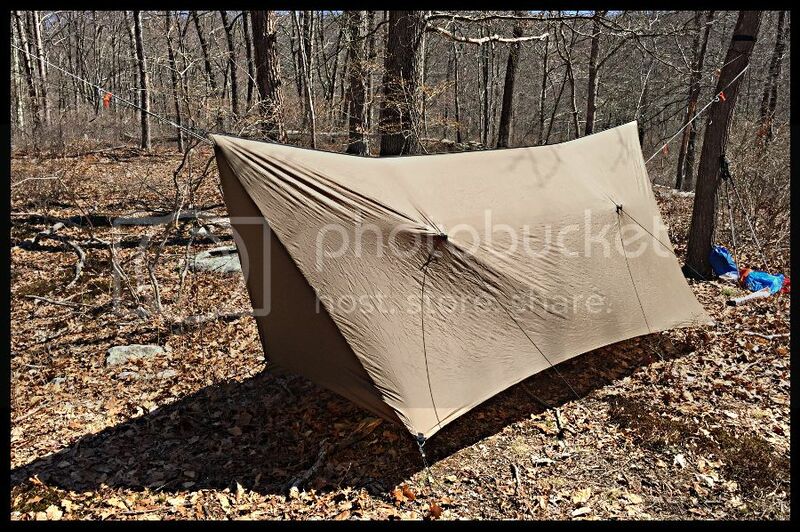 i just came back from an overnighter with a big group of hangers and i was super comfortable. thanks! i wish it came in the regular plastic too so i can get several for friends. yup, it's a really nice wind block and helps keep the heat in. thanks! 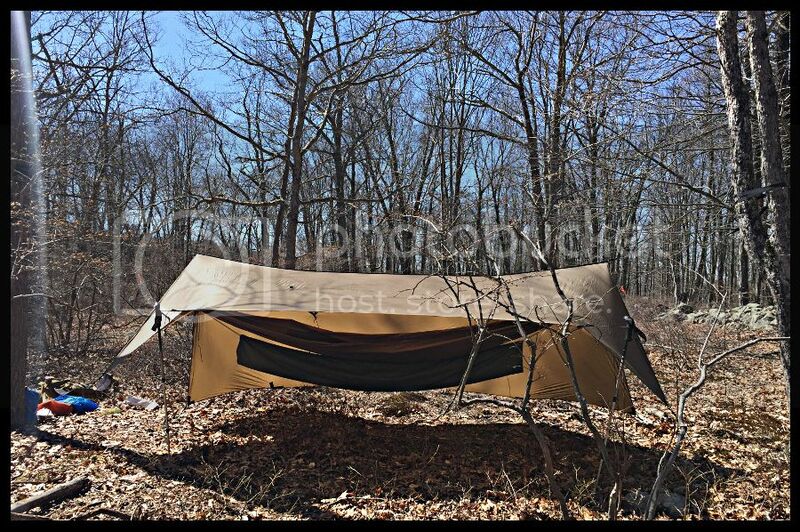 i'm still waiting for my hammock gear underquilt (should be shipping anytime now) and the real experimentation and fun begins. it did help though checking other people's setups over the weekend.